only by the quality of our caring. Welcome to Clay Center Family Dental Care, a dental practice located in Clay Center, Kansas. Dr. Dustin Kruse has been proudly serving patients throughout Clay Center community and the surrounding areas like Concordia, Manhattan, Junction City, Abilene, Washington, Beloit, and Jewell, Kansas and Nebraska for years. We provide a wide range of quality family, cosmetic, preventative and restorative dental care including Sedation Dentistry, Tooth-colored fillings, Crowns and Bridges, Implants, Dentures and Orthodontics. We can be easily reached Monday – Friday from 8:00 am – 5:00 pm at (785) 632-3126 or filling out the contact form located on the Contact Us page. When you visit Clay Center Family Dental Care the entire team is dedicated to providing you with the personalized, gentle care that you deserve. Part of our commitment to serving our patients involves providing information that helps them to make more informed decisions about their oral health needs. This website is a resource we hope you’ll find both easy to use and informative. 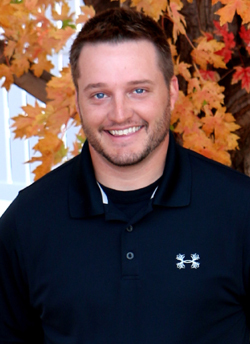 Dr. Dustin Kruse was born in Oakley, Kansas and moved to Salina early in his childhood. He graduated from Southeast of Saline High School in 2001, and received his Bachelor’s Degree in Microbiology from Kansas State University in 2005. While attending Kansas State University, he was very involved on campus and was an active leader in organizations such as American Red Cross, Mortar Board, and Phi Gamma Delta. He was also an active research associate in the Terry C. Johnson Cancer Center, and his research was published in the Journal of Molecular and Cellular Biology. Everyone seems cheerful and friendly and helpful. They work at “serving”and do a good job both serving and in the services they provide. Today I got my teeth cleaned. I like it that Kelly keeps me informed about my teeth and gums and whether they are improving. She offered helpful advice and encouragement. As always, everyone at the office was wonderful. Before I started going to Clay Center Family Dental it had been years since I had been to a dentist and was scared to go, but now I don’t mind going at all. They are great! I always look forward to going to the dentist. Wonderful staff. Great service. No waiting for your appointment. Quick in and out on the services provided. Great plus in this time starved world. All I can say is its an excellent place to go for dentistry. If your terrified and afraid of having dental work done this is the place to be so I highly recommend it to everyone and anyone. Very good service and friendly. Give honest evaluation. The individuals both in the front office and the dental professionals were timely, efficient, and very effective. I would recommend this very highly. If anyone ever had a fear of dental work this is the place to go for all your dental problems as the people and workmanship is wonderful. Staff is always very friendly and courteous, also very efficient. I am always impressed with the service at your office. Not only is the quality top notch, they know me and care about my needs. Every time I go in for a visit the check up is far beyond just the normal service. They answer all my questions and keep an eye on anything that could happen in the future of my dental needs. Excellent service & personal attention. Very professional & knowledgeable hygienist. Answered all by questions & took the time to explain every step of the procedure. The staff is very friendly and made me feel quite comfortable. This type of expertise & attention is often hard to find so I didn’t mind the hour drive to your location. Looking forward to seeing everyone on my next visit. 6 month cleaning & X-rays. The dental hygienist was very friendly & cleaned my teeth with expertise and did a good job. Dr. Kelly has a very caring & personal way when speaking to her patients. The office personnel are very friendly and it’s a pleasant experience coming to your office. Thanks. Everyone is very nice and friendly. I am always welcomed by my first name and all employees go out of their way to be accommodating. The care you receive is very professional. They know what they are doing and do an excellent job of it! My sons and I have been going to this dental clinic for 7 years and I have had nothing but great experiences. The staff is kind and friendly. They are willing to answer any question that I have and also will work with me on appointment times. They are great with my sons and make all appointments very pleasurable. I would recommend them to all my friends and family. Thank you for making her first dental visit/exam a wonderful and fun experience! She is ready to come back! I used to be afraid to go to a dentist. These wonderful people are so caring that I now look forward to my appts. I appreciate the state of the art equipment, organization, friendliness and professionalism of the staff. Would definitely recommend them to anyone! The follow-up definitive therapy perio exam and evaluation were very thorough and encouraging!! The scheduled cleaning and a few laser treatments were high level professional and well done!! Goal of new level of daily dental hygiene for myself–combined with professional hygienist care on a regular basis–is to maintain and possibly even improve on the results of today’s exam!!! Thank You Alisha (And The Staff at CCFDC)!!! I was very pleased with the work. I don’t like work on my teeth but this was such an easy appointment. Thank you for the great work. The best Dental service I have ever had. From the first contact with the receptionist and through the services provided by Dr Harness and her staff, I was given a complete exam, xrays, cleaning and recommendations for future treatment. I was concerned, as I have had some bad experiences from dental work received from the 1950 and 1960 era. The manner of concern and treatment that I received turned a dreaded visit to the dentist into one of appreciation for me. I would recommend their office to anyone. Thank you for your great work. Where You Are Treated Like Family! Clay Center Family Dental Care has been my wife’s dentist, while I continued to go to the dental practice that I had been with for years. Recently, I had a dental emergency & my dentist was unavailable. I was experiencing a great deal of pain & did not wish to wait several days. Much to my relief, Clay Center Family Dental Care set up an appointment for me immediately. I saw Dr. Harness & was very impressed with how she explained my situation & what my options were. We were leaving on a trip that had been planned for months & her good work kept our vacation from being a disaster. The entire staff at Clay Center Family Dental Care are friendly & make you feel as if you are family. I just had my six month check up & cleaning. I was very impressed with my hygienist’s professionalism. It made for a more pleasant experience than some of my past cleanings. The staff was very accommodating in arranging our next check up & cleaning on a date that works well for my wife & I to come on the same day. That is much appreciated since we are driving 80+ miles one way from home for our dental visits. Our being willing to do that should speak volumes of our satisfaction with Clay Center Family Dental Care! Everyone was very friendly and made us feel very comfortable. Also very helpful in giving options and suggestions for future care. Would definitely recommend to anyone! I have always had great service! They are extremely professional and very friendly. I would recommend them highly!! I will continue to recommend people to your office. Excellent help and good place to have your teeth taken care of. Thank you for everything you do for my family!! Welcome to Clay Center Family Dental Care, a dental practice located in Clay Center, Kansas. Dr. Dustin Kruse and Dr. Kelly Harness have been proudly serving patients throughout Clay Center community and the surrounding areas like Concordia, Manhattan, Junction City, Abilene, Washington, Beloit, and Jewell, Kansas and Nebraska for years. We provide a wide range of quality family, cosmetic, preventative and restorative dental care including Sedation Dentistry, Tooth-colored fillings, Crowns and Bridges, Implants, Dentures and Orthodontics. We can be easily reached Monday – Friday from 8:00 am – 5:00 pm at (785) 632-3126 or filling out the contact form located on the Contact Us page. Dr. Kelly Harness was born in Vancouver, British Columbia, Canada. She grew up playing soccer and snowboarding in the many mountains in British Columbia. After her graduation from high school she was awarded an athletic scholarship in soccer and went to Oklahoma State University and then University of Wyoming where she graduated with a business degree. Invisalign straightens teeth to give you the confidence of a great smile. Using a series of clear, virtually invisible aligners, Invisalign gently and gradually moves your teeth based on the treatment plan prescribed by your orthodontist or dentist. Every way you look at it, dental implants are a better solution to the problem of missing teeth. While high-tech in nature, dental implants are actually more tooth-saving than traditional bridgework, since implants do not rely on neighboring teeth for support. Comfortable dentistry is used to provide a relaxing and anxiety-free experience at the dentist’s office. It enables individuals too afraid to go to the dentist to receive the dental care they need while avoiding the apprehension.